Applicable in many countries: USA, Canada, Bahamas, Colombia, Costa Rica, Cuba, Mexico and many more. For details, please check out our country list. 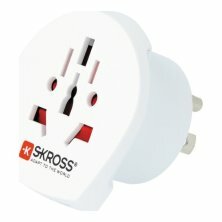 Receptacles for: Switzerland, Italy, Brazil, UK, Australia/China, Euro. You plan a city trip to New York or Vancouver, want to explore the famous US national parks or the Niagara Falls? Then this country adapter will be your perfect companion!